Michael Johnson and Andre Fili are making the trip to Lincoln, Nebraska. UFC officials announced that Johnson vs. Fili will take place on the UFC Lincoln card (via Journal Star). The event takes place inside the Pinnacle Bank Arena in Lincoln, Nebraska on Aug. 25. This will be Johnson’s second bout as a featherweight. “The Menace” has been in a rough slide as of late. He’s gone 1-5 in his last six outings. His last win was back in Sept. 2016. Johnson earned a vicious first-round knockout victory over Dustin Poirier. Since that bout, Johnson has been finished by Khabib Nurmagomedov, Justin Gaethje, and Darren Elkins. As for Fili, he’s gone 3-3 in his last six fights. “Touchy” would extend his winning streak to three if he can get past Johnson. Fili pulled off decision victories over Artem Lobov and Dennis Bermudez. UFC Lincoln features a new main event between Justin Gaethje and James Vick. Gaethje was initially set to take on Al Iaquinta, but “Raging” pulled out of the bout for undisclosed reasons. The card will also feature a strawweight bout between Alexa Grasso and Angela Hill. Flyweights John Moraga and Deiveson Figueiredo are also set for the card. MMA News will provide you with all the details you need going into UFC Lincoln. 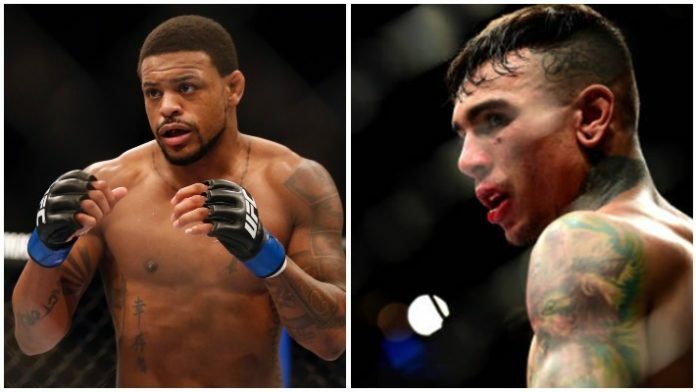 Who do you think takes it, Michael Johnson or Andre Fili?